James Marshall Mayes, Sr. (known as Marty to his friends and Poppy Sweetheart to his adoring family) of Olney, MD passed away peacefully at home on Friday, February 8, 2019 surrounded by his loving family. Marty was born on February 21, 1937 in Washington, DC to the late James and Mary Mayes. Marty was an elevator service mechanic with Local 74 in Tampa, FL for most of his career. He was most proud of his service in the United States Marine Corps and as a Montgomery County Police Officer. He loved spending time with his wife, children, grandchildren, and great-grandchildren. He treasured his time fishing, hanging out with all of his dogs up at the shop while working on his El Camino and listening to George Jones and Stevie Ray Vaughn. 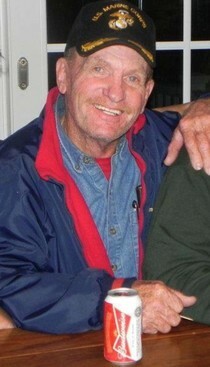 He will be most remembered for his witty sense of humor, his enduring strength and love of a cold Budweiser. Marty is survived by his wife of 51 years; Ruth Mayes, eight children, Walter Mayes, Paula Liscinsky, Arthur Mayes, Letha Keith, Mary Mayes, Marty Mayes, Jr., Margaret Dickerson, and Grace MacDonald; his sister, Mary Alethia Mayes, 16 grandchildren; 10 great-grandchildren, with three more on the way. Relatives and friends may visit on Tuesday, February 12, 2019 from 10am to 11am at Oakdale Church, 3425 Emory Church Rd., Olney, MD 20832, where a Memorial Service will be held at 11am. In lieu of flowers, donations may be made to Montgomery County Hospice.